The pupils and support staff of purple class have been working hard again producing another animation video. Their latest work is a short animation film titled ' Strictly Stoneage'. Click below to watch. Enjoy! We hope you enjoy watching this video showing some of the animals living near to the school. This month, Tony Whitehead and Chris Booth visited Blue Class at Bidwell Brook School to work with the young people there. The workshops were about healthy eating and keeping well by eating well. Tony and Chris made us radio features on special healthy foods including starchy food, protein-rich omelettes and fun snacks, like popcorn! 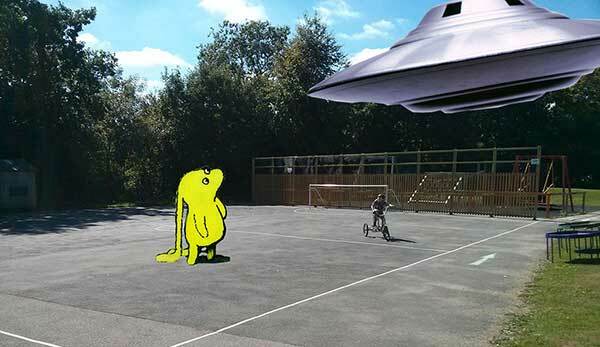 The pupils from Red Class discovered a crashed spaceship in the school playground and they then went on an adventure in search of Beegu. Click on the video to play.